The Book Design Review The Book Design Review: C'mon, Canada! What's that? How can you help? Well, Google also tells me that my returning visitors have outnumbered my new visitors by 3:1 or so over the last two weeks. If you like this blog, spread the love and link to it. Tell your mom about it. More readers = more comments = we all learn more, and that's a good thing. Thanks. Thanks, Eileen. Be sure to tell us when the cover is done for In The Stars. Cool - I know which one is me! (The central/southern Australian blob)! 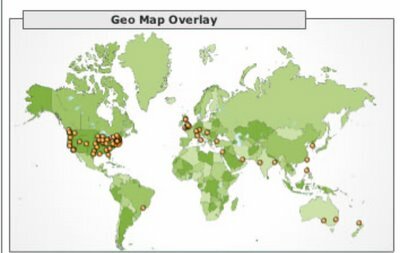 Actually, it looks like you have great coverage in Canada (Vancouver, Toronto, Montreal etc). Most of Canada is wilderness. hey hey Manila's there!!!! yahoo!! I linked you long ago. Every decent site deserves recognition and you seem to put alot of effort into this particular blog. contributing to the canada love!